2018 comes with us nearly a half and prove that it’s a Joomla year to come back. And Joomla Social Extensions seem to be a prominent niche to deeply dive. The article will list you best Joomla social extensions in 2018 which will enhance your site and help your Joomla site get a good interaction with customers. JUX Instagram Feed dedicates users a beautiful display of Instagram images on the website. 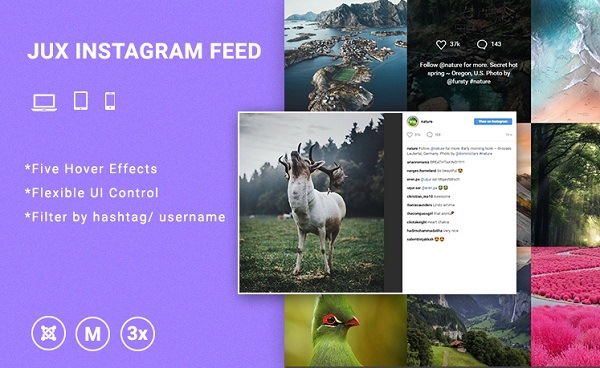 You can do whatever you want in presenting your Instagram feed by using this flexible and easy-to-use Joomla module. Since being launched, the Joomla extension had appealed to a large of customers by “simple and efficient”. “Excellent module, excellent service”, “a versatile module” and other kind words. SP Tweet is an amazing Joomla module which helps you integrate Twitter into your Joomla site. This Twitter module can smartly display tweets from any username. This module allows users to customize the number of tweets to display, hide or show user avatar and link avatar to twitter id, show tweet time or link tweet time to the tweet status and many more. 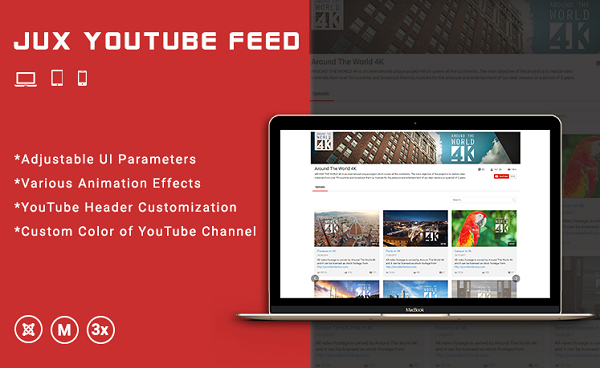 JUX YouTube Feed gives you a solution in smartly organizing and nicely showing YouTube videos on the Joomla website. The module will enlarge your audience and keep them spend more time on your website with embedding YouTube Channel. Using this social extension, you not only display randomly the latest videos from YouTube Channel but also set favorite Channels or Playlist, and select resource to use. BW Social Share dedicates users an easy to setup and customizes social share buttons Joomla Module on their website. Being in details, the extension uses "Ridiculously Responsive Social Sharing Buttons" jQuery library by Kurt Noble. With numerous social share service supported like Facebook, G+, Twitter, Pinterest, etc. ), you can freely choose the social network you wish to share. Easy and Efficient! JUX Social gallery is a fast, easy to use and responsive Joomla social module which can automatically display pictures from social networking sites like Facebook, Instagram, google plus or Flickr to your website’s gallery. Using this Joomla social extension, users get a comfortable feeling with beautiful images which are displayed on a neat and fit frame size and are willing to give kind words for the Joomla extension “Very nice and practical gallery”, “Amazing support! Good Tool” and “great looking gallery”. 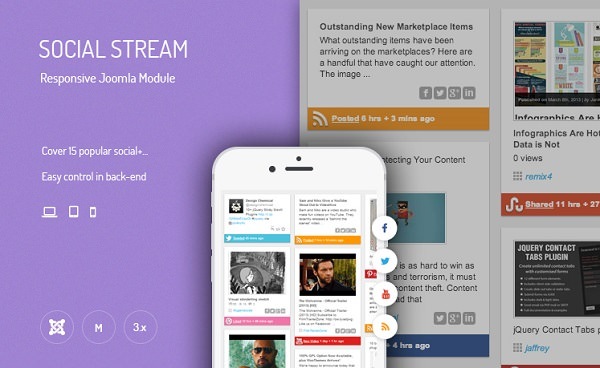 JUX Social stream combines all of your different social network site interactions into a single network stream or displays them on a Wall in masonry style. The extension allows you show all of the latest interactions into a single network stream and that is a perfect way to increase the conversion rate with the site. Customers feel pleased with what the Joomla social extension offers, especially “covering all the main social media streams with basic collage layout that I wanted”. The latest version is fixed some issue and update more new styles. • Change the social config setting to tab layout.